A sandbox TPP action game. The plot of Sleeping Dogs draws inspiration from Asian action movies, especially the works by John Woo. The main protagonist, detective Wei Shen, tries to infiltrate the structures of a dangerous criminal organization called Sun On Yee. 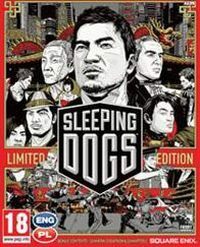 Sleeping Dogs for PC, PS3 and X360 was originally intended to be the third part of True Crime game series, but after legal turbulences it became necessary to change the title, however, not the concept of the game. This time you get to visit the Far East. The story is heavily inspired by Asian action movies in John Woo's style, such as e.g. Hard Boiled. In the game you meet detective Wei Shen, who tries to infiltrate a dangerous criminal organization - Sun On Yee. In order to gain trust of the gangsters Wei must do jobs for them, moving up the Mafia hierarchy. The road leads through a number of smaller or larger missions, during which you get to drive fast cars, jump across rooftops, or fistfight. The elements mentioned above make up the main contents of Sleeping Dogs for PC, PS3 and X360. The hero soon learns martial arts, how to use various weapons, and many other killing techniques. The action takes place in Hong Kong, divided into several diverse districts (from the rich Central HK, down to the poor Aberdeen). Of course, there are many side quests and challenges scattered across the city, which altogether add to the fun. An important element of the game is the moral aspect of the work of an undercover detective, which is strongly inspired by Splinter Cell: Double Agent. The player must be careful, on the one hand, not to drag the character to the dark side, and on the other, not to lose trust of the new employers. The inspirations of the countless American and Asian action movies are shown in overemphasized stylistics and expressive visuals of the production. Visually the game looks really good, and successfully captures the atmosphere of an East Asian metropolis in all its glory. Guide to the Sleeping Dogs is a complete compedium about surviving in the hostile, metropolitan Hongkong. And successfully stand against powerful mafia.